If you're looking for the analysis of the Human Rights Watch report, click here. 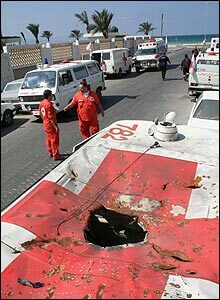 On the night of July 23, 2006, an Israeli aircraft intentionally fired missiles at and struck two Lebanese Red Cross ambulances performing rescue operations, causing huge explosions that injured everyone inside the vehicles. Or so says the global media, including Time magazine, the BBC, the New York Times, the Los Angeles Times and thousands of other outlets around the world. If true, the incident would have been an egregious and indefensible violation of the Geneva Convention, and would constitute a war crime committed by the state of Israel. But there's one problem: It never happened. Of all the exposés and scandals surrounding the media's coverage of the Israel-Hezbollah conflict in Lebanon, The Red Cross Ambulance Incident stands out as the most serious. The other exposés were spectacular in their simplicity (photographers staging scenes, clumsy attempts at Photoshopping images), but often concerned fairly trivial details. What does it matter whether there was a big cloud of smoke over Beirut, or a really big cloud of smoke, as one notorious doctored photograph showed? The fact that the media was lying was indeed extremely important, and justified the publicity surrounding the exposés -- but what they were lying about was often minor, a slight fudging of the visuals to exaggerate the damage. The ambulance incident, however, was anything but trivial. The media accused Israel of the most heinous type of war crime: intentionally targeting neutral ambulances which were attempting to rescue innocent victims. If true -- and it is almost universally accepted as true -- then Israel would lose any claim to moral superiority in the conflict. The commanders who ordered the strike should be brought up on war-crimes charges. As it is, the worldwide outcry over Israel's purported malfeasances grew so strident that the country was pressured into a ceasefire. The media's depictions of Israel's actions so influenced public opinion that Israel felt compelled to end the fighting right at the moment it was starting to gain the upper hand. And as a result, Hezbollah has now claimed victory. The Red Cross Ambulance Incident was perhaps the most damning of all the evidence against Israel, and the most morally indefensible. Other incidents were open to debate: in those cases where Israel bombed buildings that turned out to have civilians inside, Israel claimed either that it didn't know the building was occupied, or that it was trying to hit a Hezbollah stronghold elsewhere in the same building; or that the strike was a mistake, an errant missile. But targeting clearly marked ambulances, and hitting them directly -- there's no possible excuse for that. So this specific incident contributed to the outrage over the war, eventually causing Israel to stand down. Which makes it all the more shocking to learn that the attack on the ambulances most likely never occurred, and that the "evidence" supporting the claim is in fact a hoax. First, let's review exactly what is supposed to have happened, by looking at the media's coverage of the incident; next, we will examine how the evidence does not hold up under close examination. The latest of these incidents occurred on 23 July, at 11.15 pm in Cana, a village in southern Lebanon. According to Lebanese Red Cross reports, two of its ambulances were struck by munitions, although both vehicles were clearly marked by the red cross emblem and flashing lights that were visible at a great distance. The incident happened while first-aid workers were transferring wounded patients from one ambulance to another. As a result, nine people including six Red Cross volunteers were wounded. Notice how this initial description is fairly neutral: no mention of who fired the munitions, or what type they were, or the extent of the damage. ...the Lebanese Red Cross suspended operations outside Tyre after Israeli jets blasted two ambulances with rockets, said Ali Deebe, a Red Cross spokesman in Tyre. In the incident Sunday, one Red Cross ambulance went south of Tyre to meet an ambulance and transfer the wounded to the hospital. "When we have wounded outside the city, we always used two ambulances," Deebe said. The rocket attack on the two vehicles wounded six ambulance workers and three civilians - an 11-year-old boy, an elderly woman and a man, Deebe said. 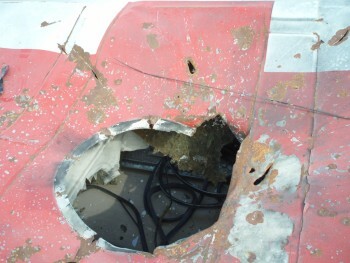 "One of the rockets hit right in the middle of the big red cross that was painted on top of the ambulance," he said. "This is a clear violation of humanitarian law, of international law. We are neutral and we should not be targeted." 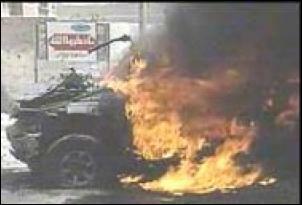 Kassem Shalan, one of the ambulance workers, told AP Television News that nine people were injured. "We were transferring the wounded into our vehicle and something fell and I dropped to the floor," he said. Amateur video provided by an ambulance worker confirmed Deebe's account of damage to the vehicles, showing one large hole and several smaller ones in the roof of one ambulance and a large hole in the roof of the second. Both were destroyed. ITV host: Well we've seen it there, haven't we, Captain Delall? This can't go on, this indiscriminate slaughter of Lebanese civilians. Captain Delall: "We have nothing against the Lebanese civilians. We never intentionally target civilians, and certainly not ambulances or aid workers. ITV host: Excuse me, but with the greatest respect, we're talking about the Israeli army. Do you accept that hitting a Red Cross ambulance and a convoy of civilians fleeing are acts that are flagrant breaches of the rules of war? ITV host: ...The U.N. tells ITV News that Israel is breaking the rules of war. Julian Manyon: The air attack on two Red Cross ambulances has increased the controversy surrounding the Israeli assault on Lebanon. ... It's noticeable that one burst of fire struck the exact center of the cross on the roof of one of the ambulances. ... Because of the extreme dangers of the roads, journalists have not visited the scene. These pictures were taken by a local amateur cameraman. ITV host: Israel's enemies are saying attacks like that one are tantamount to war crimes. "But on Sunday night, the emblem of the Red Cross was not enough to deter an Israeli helicopter gunship from firing missiles into a pair of ambulances loading casualties in the village of Qana" ... "As Shaalan closed the back of the ambulance, however, a missile punched through the roof of the vehicle and exploded inside. "There was a boom, a big fire and I was thrown backwards. I thought I was dead," Shaalan recalls. ..."Then a second missile struck the other ambulance." ..."The father's leg was severed by the exploding missile." ... "There was no immediate comment from the Israeli authorities on why a helicopter gunship had attacked a clearly marked Red Cross ambulance." The ambulance headlamps were on, the blue light overhead was flashing, and another light illuminated the Red Cross flag when the first Israeli missile hit, shearing off the right leg of the man on the stretcher inside. As he lay screaming beneath fire and smoke, patients and ambulance workers scrambled for safety, crawling over glass in the dark. Then another missile hit the second ambulance. Even in a war which has turned the roads of south Lebanon into killing zones, Israel's rocket strike on two clearly marked Red Cross ambulances on Sunday night set a deadly new milestone. 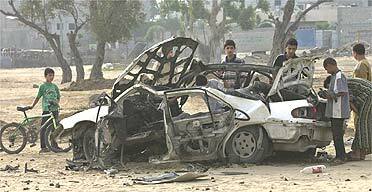 ... Two ambulances were entirely destroyed, their roofs pierced by missiles. ... One of the members of the three-man crew from Tibnin radioed for help when another missile plunged through the roof. ...He was adamant that the ambulances, with their Red Cross insignia on the roof, were clearly visible from the air. "I don't think there can be a mistake in two bombings of two ambulances," he said. The detailed specificity of the descriptions -- who was injured, their ages, their exact injuries, a second-by-second account of what happened, and so on -- make the report seem extremely credible. After reading the Guardian's account and watching the ITV News video, who could question the veracity of the incident? Kasem Chaalan had an inkling that something bad would happen. Chaalan, 28, was hurrying out of the headquarters of the Tyre chapter of the Lebanese Red Cross late Sunday evening to pick up some wounded people. As he rushed toward the door, he asked his colleagues lounging in the office to forgive him for any wrongs he might have done them. It was the first time in 13 years of volunteering for the Red Cross that he had ever uttered such words. "I don't know why I said it," he recalled Monday, hours after Israeli rockets hit his ambulance and another, wounding him and eight others. ... Late Sunday, Chaalan and two other volunteers drove their ambulance 10 miles southeast to the town of Qana, where they met another Red Cross ambulance from the village of Tebnine on its way to hospitals up north. Chaalan and his crew loaded the three wounded people into their ambulance. As he closed the vehicle's rear door, an Israeli rocket hurtled through the roof of the ambulance. ... 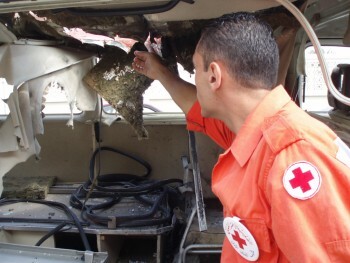 Within seconds, an Israeli missile tore through the roof of the second ambulance. ... "The incident in which vehicles were hit last night occurred in an area known to be one of the main sources of the launching of hundreds of missiles," an Israeli army spokesman said Monday. 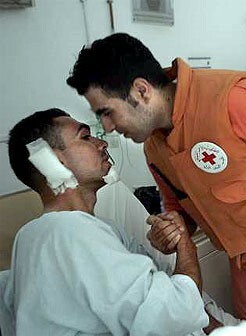 But inside their ambulances, the paramedics of the Lebanese Red Cross, Station 702, felt safe. 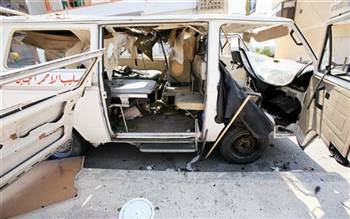 So Kasim Shaalan, who thought nothing more could shock him in this 13-day war, was shocked Sunday night when he closed the rear door of his ambulance and it exploded, seriously wounding two patients inside. ... The Israel Defense Forces said last night that Israeli fire hit an ambulance during fighting in the Qana area, east of Tyre. ``The IDF never intentionally targets civilians, much less ambulances," a spokesman said. "It should be noted that the area in which the incident took place is one from which there is intensive missile fire" directed toward Israel. ... Shaalan said he was swinging the back door shut when everything around him was engulfed in a flash of light. "A big fire came toward me, like in a dream. I thought I was dying, at first," Shaalan said. ... A rocket or missile had made a direct hit through the roof, Shaalan said, severing one patient's right leg. Six ambulance workers and their patients were wounded when Israeli missiles struck Red Cross ambulances on a rescue mission in south Lebanon. The attack took place near Qana when an ambulance from Tyre arrived intending to evacuate three patients from the border town of Tibnin. 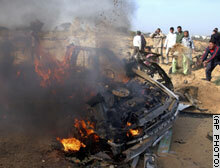 Two ambulances were completely destroyed as their roofs were pierced by missiles. According to one of the drivers, two guided missiles were fired at each ambulance. ... The patients, the Fawaz family, all had minor injuries before the missiles struck the ambulance. Now the son is losing his leg and the other is treated for shrapnel wounds. ... An Australian correspondent reports from the city of Tyre that at least 10 Lebanese ambulances bearing the International Red Cross emblem have been targeted in Israeli air strikes in the south of Lebanon that have killed more than a dozen civilian passengers on transport to hospitals. An Israeli army spokesman said, "The incident in which vehicles were hit last night occurred in an area known to be one of the main sources of the launching of hundreds of missiles." Qasim Chaalan thought he had died in the burning haze of the missile strike. ... Then the roar and smash of the missiles shattered the night. Both ambulances were hit, directly and systematically, by Israeli bombs, the medics said. At the Red Cross headquarters in Tyre, I spoke to Kassem Chaalan, 28, who told me about being in an ambulance that was struck by a missile. When the armament struck the vehicle, he says, it hit the Red Cross symbol on the roof dead-on. The volunteer thought at first that had died -- he said the blast blew him back 15 to 25 feet. 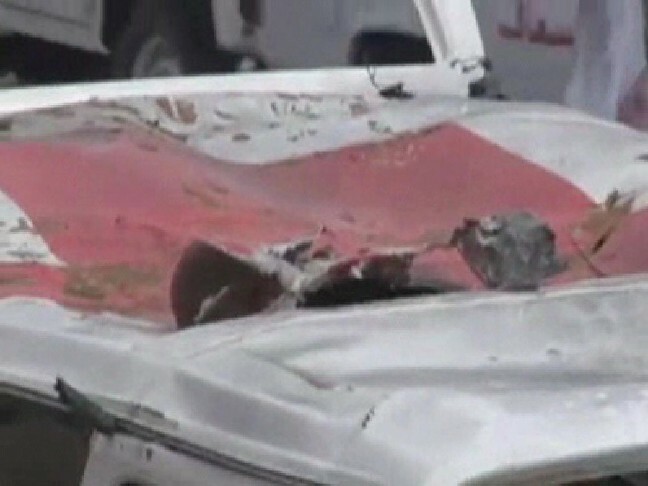 Missiles hit two Red Cross ambulances last weekend, wounding six people and punching a circle in the center of the cross on one's roof. ... "We heard on the news they were bombing the Red Cross," said Zaineb Shalhoub, a 22-year-old who survived the bombing. As the final quote above indicates, the media coverage in the Middle East about the ambulance incident was much more widespread and partisan than the Western coverage described here: it was a major story immediately, and the Middle Eastern media declared in no uncertain terms from the very start that the attack was not just intentional, but part of a systematic campaign to strike Red Cross ambulances. By the beginning of August, the story had spread to the rest of the world's media outlets, and became accepted as an unquestioned fact about the war: Israel is targeting ambulances. If you even skimmed the media quotes above, by now you're probably pretty convinced that Israel did indeed attack the Red Cross ambulances, most likely on purpose. What other conclusion could the average reader possibly reach? Dozens of reporters from prestigious publications interviewed survivors. The wounded were shown in the hospital. There was video of the injured drivers arriving back at the Red Cross office. 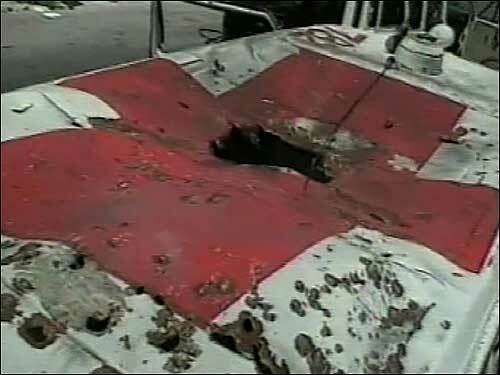 Pictures of the damaged ambulances proved beyond doubt that there must have been an attack. And if the missile struck dead center, there's no way it could have been accidental. Fortunately, you don't need to trust the words of the reporters, or the claims of the Red Cross workers. Because you can inspect the evidence yourself, and draw your own conclusions: photographs of the damaged ambulances are widely available on the Internet. 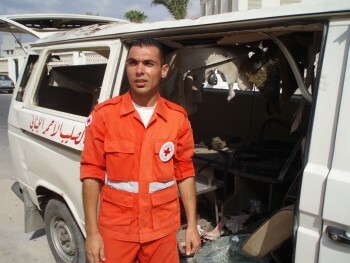 Although at first the Red Cross workers kept reporters away from the vehicles, a "local cameraman" did take pictures of the damage starting just hours after the attack; and after a few days, at least one of the ambulances was towed and parked in front of the Red Cross offices in Tyre, where anyone could photograph it. As a result, there are plenty of images to choose from. Will the story withstand an examination of the evidence? The answer, as you will soon see, is a devastating No. On the night of July 23, an ambulance left Red Cross station #702 in Tyre to rendezvous with another ambulance ferrying patients from further south. While transferring patients from one ambulance to another on a road in Qana, a missile fired from either an Israeli jet or helicopter pierced the exact center of the cross on the roof of the ambulance from Tyre, severing the leg of one of the patients inside, and causing a huge fire and explosion that knocked the driver as much as 25 feet away. Immediately afterward, a second Israeli missile pierced the roof of the second ambulance as well. 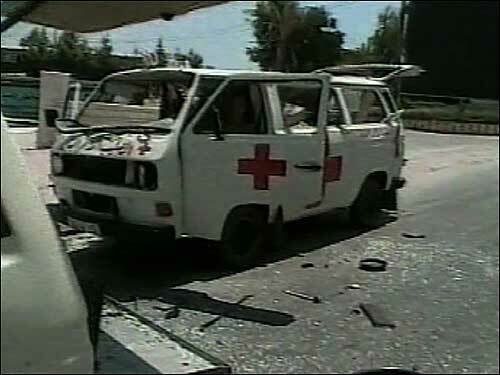 All the patients sustained major injuries, and all the Red Cross workers received lesser injuries. After hiding out for a while in a nearby building, they were later picked up and brought back to Tyre by a third ambulance. Let's look at each claim one by one, and see if any aspect of the story stands up to careful analysis of the evidence. 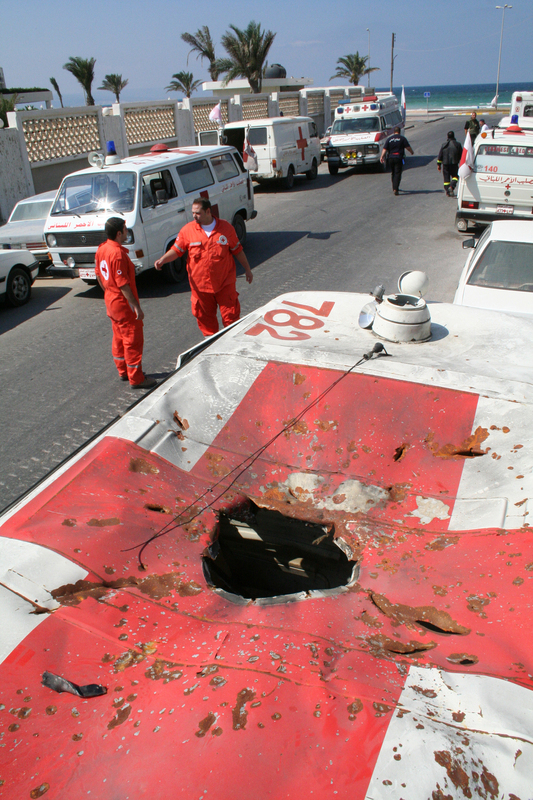 Claim #1: An Israeli missile pierced the exact center of the red cross on the roof of the ambulance. 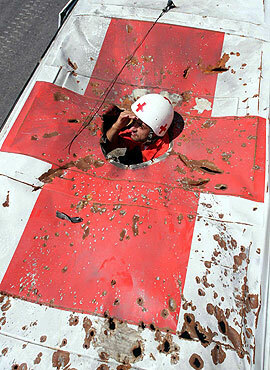 Lo and behold, when we look at other pictures of undamaged Lebanese Red Cross ambulances, we see that many of them just happen to have a ventilation cover of the exact same diameter as the "missile" hole right in the center of the cross on the roof. The picture on the left is taken from the Lebanese Red Cross site itself; the picture in the middle is from Getty Images; and the last picture is a screenshot from the ITV News video linked to above. As is also confirmed by some of the images below, it's obvious to the naked eye that the hole in the center of the cross on the roof of the "damaged" ambulance was simply a standardized pre-existing hole to which a ventilation cover had originally attached, and then roughly stripped off. The Virginian blog summed it up nicely: "NBC shows a picture of an ambulance with a hole in its roof as 'proof' that Israel is attacking ambulances. The problem is that the hole, which is right in the middle of the Red Cross on the roof, could not possibly be the result of a hit by any weapon. A shell or missile that size hitting the ambulance would not leave the rest of the vehicle intact. All that you would see would be twisted wreckage and a debris field. A more reasonable explanation for the hole is the removal of the emergency light or siren which also explains why the hole is centered precisely on the cross." Since the other ambulances have visible sirens and lights toward the fronts of the vehicles, the function of the red dome in the center of the roof is almost certainly for ventilation. Conclusion: The hole in the roof was not caused by a missile strike. Claim #2: The attack happened on July 23. Here are two more pictures of the same ambulance roof. 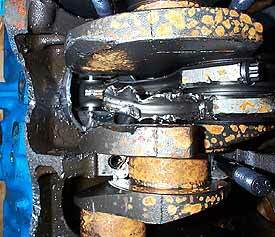 When looking at these two pictures, keep one word in mind: rust. Both images appear to show that the roof is rusted wherever the paint is scratched away. At least, as far as can be determined at the level of resolution in both pictures. Notice carefully again how this is indeed the same ambulance in all the photos: there are three white splotches adjacent to the hole in each image, as well as all the other distinctive marks. The one on the left is a close-up (provided by Reihl World View) of this Reuters picture in the Malaysian newspaper The Star (with a typo in the caption) [UPDATE: The Star has removed its version of the picture, but a slightly larger version of the exact same picture was published in The Australian on August 31 (as part of an article discussed below), which is now displayed here in place of the smaller Star version]; and the one on the right comes from the BBC. This is a close-up of the central part of the roof. Suddenly, the rust appears vividly, unmistakable and widespread, when the roof is shown in clear focus. Here are some more extreme close-ups of the roof. Notice especially how the rust appears to be quite old in some areas. Rust that extensive does not appear in a matter of hours or days. It usually takes months to develop, especially in dry climates such as Lebanon in the summer. Notice the blue sky in the second picture -- it had not been raining. The presence of rust on every part of the roof where the paint has been scratched away proves that the damage to the metal happened long before July 23 -- most likely several months earlier, or more. And if that's the case, then the damage we're seeing did not happen on July 23, and was thus not the result of an Israeli missile strike. (And the screw holes for holding on the vent cover are clearly visible here as well, further confirming that the hole was a pre-existing feature of the vehicle.) See the "Media Responds" section below for more evidence about the rust. Conclusion: the rust on the dented areas of the roof proves the damage must have happened long before July 23. Claim #3: There was a huge explosion inside the ambulance. Here are two photos showing either side of the ambulance. The picture on the left comes from Indymedia and the final one was taken by a Lebanese photographer and posted here. Looking at the picture on the left, it might appear at first glance that the ambulance could indeed have been blown up. But look again carefully. When there is an explosion inside a vehicle, things get blown outward. Yet the windshield is caved inward. In fact, assessing both pictures, nothing looks blown outward at all -- the metal frame is pretty much intact and unscathed, and not buckled in any way. Furthermore, aside from some of the ceiling material hanging down, nothing on the inside of the ambulance looks damaged either. All the seats, gurneys and even the floor appear to be untouched, not bent or twisted as they ought to have been if a missile had exploded literally just inches away. In fact, the only part of the vehicle that seems to have suffered any kind of significant trauma was the roof. But as is revealed in this version of the well-known first picture (from the Australian newspaper The Age), all the dents and shrapnel holes are bent inward; if there was shrapnel coming from a blast inside the vehicle, they should be bent outward. Yet we're tiptoeing around the real problem. The ambulance above isn't even close to having been blown up. In reality, when a missile strikes a vehicle, it looks something like any of these four examples (images taken from here, here, here, and here), all of which actually were hit by Israeli missiles (when Israel was targeting Hamas leaders in Gaza). The first and fourth pictures come courtesy of the Infinitives Unsplit blog, which was the first to analyze what really happens to vehicles in airstrikes, as opposed to what is purported to be the damage to this ambulance. Reihl World View then had a detailed examination, pointing out that if a missile really had gone through the roof, the ambulance would have been utterly destroyed and totally mangled. Conclusion: The damage to the ambulance is completely unlike the damage that would have been caused by a missile strike. Claim #4: There was an intense fire inside the ambulance. Since the ambulance driver described both an explosion and a fire (remember these quotes from the articles cited above: "There was a boom, a big fire and I was thrown backwards"; "A big fire came toward me, like in a dream"; "As he lay screaming beneath fire and smoke"), let's address them as separate issues, even though concussive damage (from an explosion) and heat damage (from a fire) often happen simultaneously. These three photos are all versions of ones shown earlier. 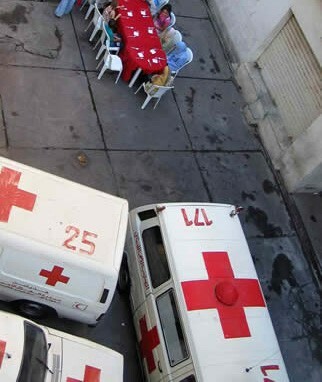 The first one (courtesy of Reihl World View) is an enlarged look at the inside of the ambulance. Notice how the gurney, and the light blue cloth on it, are completely fresh and untouched. The plastic seat covers are not melted. There doesn't seem to be any smoke discoloration of any kind. The pieces of fabric hanging from the ceiling show no indication of being burned in any way (the one darkish piece appears to simply be material that was brown to begin with, not burned; the other pieces are all light-colored). The second photo shows the floor from above. Again, no burn marks. The cables have not melted. The third picture, a small version of the Indymedia picture shown full-size above, is included here to demonstrate that the entire vehicle displays absolutely no hint of burning, scorching, smoke damage, or anything else that would indicate a fire had erupted inside or outside the vehicle. This rare photo, which I obtained from a now-defunct Lebanese Web page, must have been taken prior to all the other photos in this report, because it shows a portion of the foam lining around the inside of the hole. Notice how the foam is completely unburned, unscorched and unmelted, indicating definitely that there must have been no fire or intense heat in the vicinity, since foam scorches easily and the missile (if there had been one) must have literally touched the foam as it passed through the hole. Conclusion: There is no evidence that the ambulance has been damaged by fire. Claim #5: A man lying on a gurney inside the ambulance had his leg sheared off by the missile. For this claim, we can again rely on the same three photos shown immediately above. First of all, we already demonstrated that no missile ever penetrated the roof of the ambulance to begin with, so this claim is already facing serious credibility issues. But aside from that, is there anything to indicate that a missile cut off the leg of a man who was lying in the ambulance? Look once more at the gurneys in the picture on the left above. The front gurney's cloth is unstained, and its frame is intact. The back gurney also appears to be undamaged. As Reihl World View says, "From the accounts, there was a man lying on one of the built in gurneys pictured -- his leg severed by the missile. So how is it that neither gurney shows any damage at all? What was this, laser surgery?" And as the pictures show, the floor seems to be undamaged as well. If a missile sheared off his leg, where did the missile go after that? And lastly: losing a leg is an extremely bloody affair. Where is the blood? If the injury happened as described, the inside of the vehicle should have been drenched in blood. But there is not one drop visible. Yet the ITV News video above purports to show evidence of the leg amputation. A picture flashes by very quickly as the narrator says "Two of the injured civilians in the ambulances received terrible additional wounds." When the video is viewed online, the image goes by too fast to be seen clearly, but I managed to get a freezeframe screenshot of the scene, shown here. What ITV implied was an amputated leg on one of the ambulance's gurneys appears, under closer inspection, to be a human hand on a stretcher that may or may not have anything to do with the ambulance in question. None of the accounts said anything about a hand being cut off. So what does this picture have to do with the ambulance incident? Nothing, most likely. Also casting doubt on the credibility of the story is this report from Kevin Sites in which one of the ambulance drivers says that the man lost both legs in the attack. Why not keep exaggerating the story since the journalists never seem to bother verifying the claims? Even so, various videos and pictures show a man in a hospital who really does seem to have part of a leg missing. (This BBC video for example shows the three civilians supposedly injured in the attack, but the video only works sporadically for viewers not in the UK.) The journalists repeat uncritically the ambulance driver's assertion that the man had his leg cut off by an Israeli missile as he lay in the ambulance. But what proof is there that this man's unfortunate injury had anything to do with the ambulance incident? Might he simply have been a hospital patient whose injury was completely unconnected to the ambulance in question, but who was paraded before the cameras as a victim of an Israeli missile? Conclusion: Though there exists a man who indeed lost part of his leg, all evidence indicates that his injury did not take place in the ambulance and was not caused by a missile strike. Claim #6: You're analyzing the wrong ambulance, you idiot. What with all the debunking of the photos above, readers still determined to believe the original ambulance-attack story might think, "What's going on here? Yes, your analyses may be valid, but how do you know this is even the right ambulance? These pictures obviously show that an ambulance was not hit by a missile strike -- so you must be wasting your time analyzing the wrong ambulance." Similar captions describing the exact same ambulance appear in dozens of other articles. 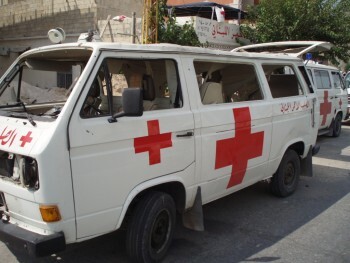 And the distinctive code numbers, white blotches and other markings leave no doubts whatsoever that the ambulance depicted in all the pictures here is indeed one of the ambulances that the Red Cross drivers claim was hit by an Israeli missile attack. Furthermore, the "amateur video" (in the ITV News report) which was supplied by the Red Cross itself definitely shows the same ambulance. And this gallery of ambulance pictures by an independent Lebanese photographer confirm beyond all doubt that the ambulance depicted, now parked in front of the Tyre Red Cross office, is the same one involved in the incident, since the driver himself is standing front of it pointing to the damage -- and it matches all the other pictures from the other media outlets. And lastly: if this is the wrong ambulance, then why is it being displayed to the public as evidence of an attack? Where is the right ambulance? Why hide away the authentic evidence, and present obviously fake evidence? If there was an as-yet-unknown truly damaged ambulance, then the Red Cross workers would have shown it (or its remains) to the journalists. But they haven't done so, meaning that the ambulance shown is all they have to offer. Conclusion: The ambulance shown in all the pictures above is most definitely the ambulance that the Red Cross claims was attacked. Claim #7: The ambulance driver who reported the incident was injured in the attack. Here he is again (visible here and here) six or seven days later, posing for a sympathetic Lebanese photographer after all the Western journalists had left. Notice how his chin is not only miraculously healed after a very short span of time, but (as the close-up detail in the center reveals) shows no kind of scab, scar or discoloration of any kind. The last photo also shows his chin to be in perfect condition. Since these photos are used to accompany two articles posted on the same Web site on August 1, in which the author describes seeing the driver and the damaged ambulance the day before, the pictures must have been taken on July 31. Note also that the second linked article states that he has "stitches" on his chin, indicating a deep wound. Does Qasim Chaalan have the world's fastest healing skin? 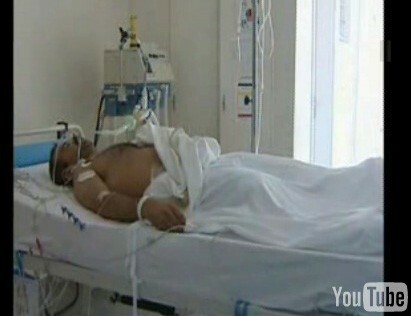 Or did he put on bandages as a prop to fool the foreign journalists? 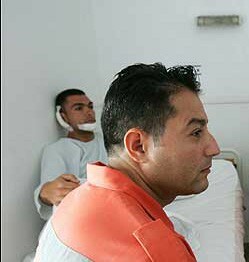 Lending credence to the "prop bandages" theory is this freezeframe from the ITV News video with Chaalan on the left side of the picture, showing his right ear when he first arrived at the hospital just hours after it was "wounded,", before he appeared in the hospital bed the following day with a bandage on it. Yet, as the picture shows, his ear was not even wounded in the first place. Since both his chin and his ear seem to have suffered no injuries in the incident, the bandages served no medical purpose, other than to say, "Look, I'm injured!." Conclusion: Either the ambulance driver had such a minor injury that it completely healed in a matter of days, or he was never injured at all. Claim #8: The Lebanese ambulance drivers are politically neutral and would have no motivation to lie. "As a Red Cross volunteer I need to be very clear that we are not political -- we rescue anyone who needs help," the 32-year-old Zatar told IPS. As a colleague unloaded bodies from bloody stretchers, [Mohammad] Zatar said "whether they are civilian, a resistance fighter or an Israeli soldier, our policy is to help any human who needs help. But the Israelis seem to be attacking us now." But perhaps that's just one man's opinion. It does not prove that all ambulance drivers, or all Lebanese Muslims, harbor a special hatred for Israel because of its supposed targeting of ambulances -- does it? Imprinted on the national psyche of Lebanon is the first "Qana massacre," which happened almost exactly a decade earlier. 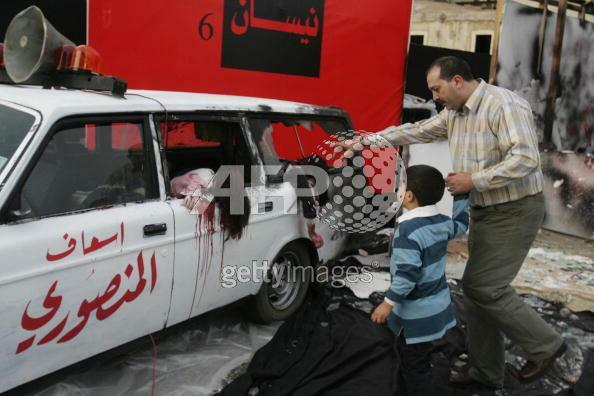 The supposed 1996 Israeli attack on an ambulance is considered such a significant event that a mock-up of the scene was displayed in the center of Beirut to mark the 10th anniversary. Conclusion: Ambulance attacks are (and have been for quite some time) highly significant to the Lebanese as symbols of national martyrdom. The ambulance drivers, who were apparently sympathetic to Hezbollah, conceivably could have staged the entire incident. Codemite.com has very interesting analysis of the high-res roof photo revealing footprints all over the roof, and a convincing case that some of the damage was caused by an axe. The Jawa Report posted this serio-comic video by "Sout al-Kuffar" called "(Video) Rocket Ride (Hezbollywood Remix)" that is simultaneously an entertaining musical montage about the ambulance hoax and also a fact-packed debunking with more eye-opening details about the deception. Another view of the roof from a different angle. Reihl World View's report on the ambulance. Infinitives Unsplit's report on the ambulance. Big Lizards has a very nice comprehensive summation of the entire ambulance debunking, with several observant points of its own. Strangely, even though this incident supposedly happened on July 23, Nada Doumani, Middle East spokesperson for the International Committee of the Red Cross, gave an interview to al-Jazeera on July 24 in which she describes earlier alleged ambulance attacks and other Red Cross activities that had happened on July 23, yet specifically fails to mention the July 23 ambulance incident, as if she was completely unaware of it: "We are aware of an incident on July 13, when a Lebanese Red Cross (LRC) ambulance was hit and three volunteers injured in the South of Lebanon. No other incidents were recorded since." How could she of all people not have known about the July 23 incident? A portion of an interview on BBC's "Hard Talk" with Red Cross spokesman Balthasar Staehelin can be seen here, in which Staehelin re-asserts that the ambulances were targetted and struck. There is a brief glimpse of the damaged ambulance in this TV report from Britain's Channel 4 from August 9 or 10, but it offers few if any new visual details. A few commenters on blogs have asserted that Israel sometimes removes all explosives from small missiles, relying on the kinetic energy of the projectile's impact to do the damage to whatever vehicle is being targeted. The reason for this is to minimize "collateral damage" and not injure bystanders by making a precision strike no larger than it needs to be. 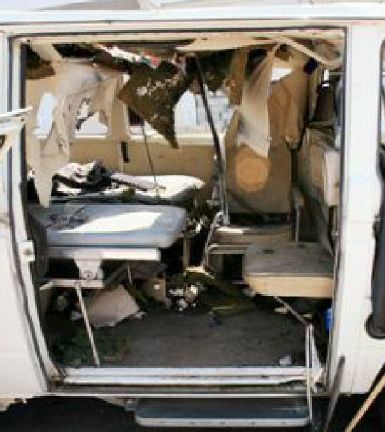 If this is true, then it is theoretically possible that Israel did use a non-explosive missile to attack this ambulance, and fired it so precisely that it passed through the ventilation cover in the center of the roof and then continued right through the leg of a patient, the floor of the ambulance, and into the ground underneath without exploding. This would account for a few of the incongruities of this case. But not for most of them. The non-exploding missile theory still does not explain the rust on the roof, the reports of explosions and fires, the undamaged flanges of the siren hole, the shrapnel holes coming from the outside, the apparently undamaged floor, etc., and most importantly: If Israel really did target a random ambulance with no military value, apparently for the sole purpose of killing rescue workers and civilians, then why would it go to the trouble of using a humane hyper-precise attack designed to minimize injuries? It makes no sense. The simplest attempted rebuttal might be: Israel already admitted to carrying out the attack, so there's nothing left to argue about. That's an interesting point. But it fails to take into account several critical facts. Firstly, it is typical Israeli government policy to: Apologize now, then investigate later. If the investigation reveals that Israel was not at fault, then the apology is retracted. This has long been the standard procedure. A recent example comes to mind: In the "Gaza Beach Bombing" incident earlier in 2006, when Palestinians accused Israel of shelling a family having a picnic on a Gaza beach, Israel immediately issued an apology for the tragedy. But when an internal investigation revealed that the explosion happened long after Israel had stopped shelling a nearby area, and likely had some cause unrelated to Israel's action, then the apology was withdrawn. So if Israel really did apologize for the ambulance incident, that doesn't constitute an admission of guilt, nor does the apology necessarily stand permanently. But that brings up the second point: I haven't been able to find any official record of that quote cited in the two articles above. If Israel really did admit to the attacks, then why, out of at least 400 articles about this incident, only two quoted the admission, and one more paraphrased it? Wouldn't the admission have been more widely reported? It's possible that the quote was an IDF member being interviewed somewhere who said, well, if the attack did happen, then we apologize. Conceivably, given the generalized nature of the purported statement, he said it without knowing the facts of this specific incident, and perhaps was not even talking about this particular incident at all. Alternately Israel did issue the preliminary statement, but then later retracted it -- yet the retraction was never reported in the media. We simply don't have enough information about Israel's purported statement to be sure one way or the other. An Israeli army spokesman told The Age yesterday that the army had not yet established what happened and the incident was under investigation. "We were in a war," the spokesman said. "It takes time to find out exactly what happened and whose fault it was and why. We are not saying it was an accident or that we take responsibility. ..."
And thirdly, even an apology from Israel does not magically negate all the evidence presented on this page. Apology or not, there is still no evidence that the attack ever happened. The ambulances were not hit by missiles, but were instead strafed by bullets fired from a helicopter. The Red Cross workers then, little by little, exaggerated and embroidered upon the tale with each new interview, until the story could no longer be supported by the evidence. But even this most plausible of theories has serious flaws. The multiple holes in the roof are much more consistent with gunfire than with a missile strike. But the holes are highly irregular, widely varying in size and orientation -- which would not be the case if they were caused by a blast from a machine gun. 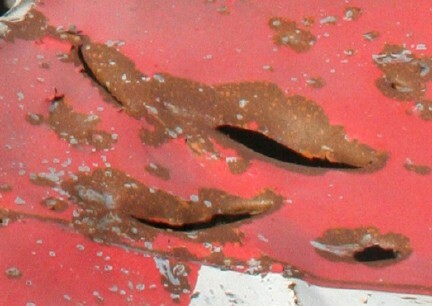 Then there is the rust, which couldn't have formed within hours of the attack, whatever projectile may have been used. Furthermore, none of the Red Cross workers reported hearing a helicopter or any other aircraft. It was just silence, they claim, then Boom! If a helicopter had been hovering overhead preparing to fire, they definitely would have heard it, and then reported it to support their story. [UPDATE: Several readers have written in to say that some military helicopters can fire on targets from such a great distance that they might not be audible on the ground ahead of time; but that any ordnance fired this way would have been so powerful as to completely destroy the vehicle.] And finally there is the disagreement over which type of aircraft fired on the ambulances -- some articles say a jet, others say a helicopter -- and still others say a drone. There is no consistent version of the story. Another critical point: a single blast from a helicopter gunship could not possibly leave the widely varying hole sizes seen on the roof, and Israeli aircraft could not leave holes with that angle of impact, as pointed out in this comment on Little Green Footballs. 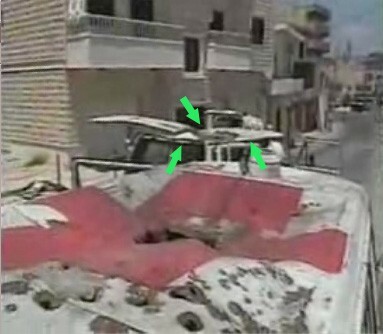 A much more likely explanation, as some commenters pointed out, is that the holes were either caused by shrapnel from some object blowing up near the vehicle, or by a variety of small arms fire from people shooting at close range, either of which could leave the variety of holes seen in the picture. And a car demolition expert writes in to say that the damage to the roof (irregular dents and gashes) matches exactly the type of damage seen when a car has another car stacked on top of it -- standard practice at automobile salvage yards (which would also explain why the sides of the vehicle are mostly intact). So even if the "Exaggerated Bullets" theory is true, the majority of the story as definitively reported in the press (missiles, fire, etc.) would still be false. The Rust on the Roof is "Flash Rust"
Normal rust takes weeks, months or years to develop, but there is in fact a type of rust called "flash rust" that can develop in a matter of hours or even minutes under the right circumstances. A few blogs -- notably the "Facts and Fiction in the current ME war" blog -- have claimed that the rust seen on the roof of the ambulance could be quick-forming "flash rust," and thus the simple presence of rust does not prove that the roof damage happened long before July 23. However, most of the rust on the ambulance roof is distinctively different from flash rust. The existing roof rust is mostly dark ruddy brown and appears to be deeply ingrained. Flash rust, in contrast, is usually usually very pale orange and looks light and thin. 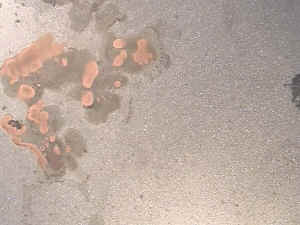 Now compare those pictures with these pictures (taken from the hi-res photo of the ambulance roof posted by the Red Cross itself) showing what the rust on the roof actually looks like. Notice how the roof rust is generally much darker, more pitted, and more deeply entrenched than the authentic flash rust depicted the three previous images. Furthermore, here and there on the ambulance roof, there actually is some flash rust, which contrasts notably with the older, darker rust elsewhere on the roof. 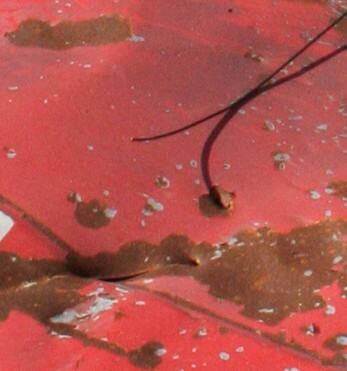 The picture shows another section of the ambulance roof where a thin patina of flash rust appears adjacent to and overlapping some earlier rust that obviously predates the flash rust. 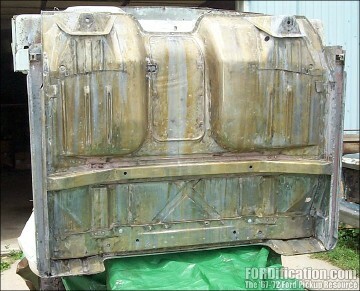 Notice how the flash rust is pale orange and somewhat translucent, whereas the older rust is much darker and opaque. And yet, as the photos shown earlier in this essay reveal, the roof is covered with the darker type of rust, with only occasional spots of flash rust, which probably formed after the vehicle was recently put on display. The "Facts and Fiction" blog above links to a forum of rust experts, and -- to make its case -- cites a comment by one of the experts that flash rust exists. But another comment on the same page says this: "I think of chain-link fences that near the coast. After a storm they are clean (from the blowing sand). Within a day of two they are orange. This is very superficial rusting, it can almost be wiped off, but it starts quickly." In fact, many car-repair forums that discuss flash rust advise readers to simply "wipe it off" as a way of getting rid of it. There are even commonplace commercial products such as this one that are for the specific purpose of wiping away flash rust: "The Gun Wipe's formulation incorporates active cleaners to wipe away flash rust and light oxidation." Now, look at the darker rust on the ambulance roof again. Does that look like something that can be lightly "wiped away" by hand? And lastly, as several emailers have pointed out: the presence of exposed metal around the roof's central hole that is completely not rusted shows that it was covered until recently, and has not rusted in the week between the claimed attack and the time most of the roof photos were taken. Thus, the heavy rusting elsewhere on the roof could not have happened during that week. So: while there is such a thing as "flash rust," all indications are that it does not explain the darker, deeper, and more permanent rust on the ambulance roof. This theory, proposed on September 1 at the Crooked Timber blog (among a few other sites) essentially posits: If this incident really is a hoax, then it entails a vast coordinated conspiracy involving the ambulance drivers and victims, the entire media, the IDF, Hezbollah, and the International Committee of the Red Cross. Such a constellation of conspirators is ludicrous, especially when it comes to the ICRC, which has a longstanding reputation of neutrality to uphold. Why would the ICRC conspire to manufacture a minor hoax and thereby ruin its closely guarded reputation? The problem with this theory is that no "conspiracy" is necessary to explain how the story may have been created and promulgated; nor have I ever alleged that there was a conspiracy. Any number of possible scenarios (including the one put forth in the Conclusion of this essay) could explain the evidence without the need for a coordinated conspiracy, or the culpability of the Red Cross as an organization. A handful of local Red Cross workers (independently and of their own accord) decide either to fake an ambulance attack, or to exaggerate a minor incident into something much more serious. They report it to their superiors at the Red Cross, who take the drivers at their word, assuming their story is true. The ICRC, in all earnestness, publishes a short press release describing the incident in fairly neutral terms. The media, eager for scandalous material, rush in and begin to interview the ambulance drivers without bothering to really investigate if their claims were true. Each media outlet, in a bid to outdo the others, publishes its own version of events, relying exclusively on the ever-growing and inconsistent tales told by the drivers. The ICRC decides, as a matter of principle, to trust and support their workers. In this manner, the story of the July 23 ambulance attack could have unfolded as it did, without the need for a "vast conspiracy" to explain it. Only the drivers intentionally deceived; the ICRC and the media simply accepted the stories as credible, but in no way "conspired" to create a hoax. Other variations are possible: that Hezbollah was directly involved in manufacturing the fake ambulance evidence; that some reporters realized the story was probably false yet reported it anyway because of their political bias; that the victims were stage-managed or bullied by Hezbollah; and so on. But none of these possibilities require that there was some convoluted conspiracy among different groups, nor is the ICRC necessarily guilty of anything other than resolutely standing by the word of a few workers who took it upon themselves to tell a fib that spun out of control. Despite the massive and widespread publicity this essay has received, few of the media outlets that originally reported the incident have even acknowledged the criticism surrounding their claims, and none (so far at least) have retracted their stories. A handful of journalists, however, have attempted to defend the reality of the attack and to question the evidence presented above. We'll look at each of their articles individually. Since my first column, the same blogs are in a tizzy over the "Zombietime" site proving that the July 23 incident, in which two Red Cross ambulances were hit from the air by the Israelis, never happened. Needless to say, there is no such proof, and my favorite line comes near the end when the writer observes "Israel already admitted to carrying out the attack," adding dryly that this is "an interesting point." Does this stop her? Alas, no. She goes on to assert that "all signs" point to a "clumsy hoax," complete with ambulances towed from a junk yard and "Red Cross workers feigning minor injuries." Perhaps the Israeli missiles were fired from the Grassy Knoll. I'd like to address the points raised by Mitchell in his piece -- but there are no real points to address. He provides no additional evidence, challenges none of the evidence presented here, and amuses himself with a flippant dismissal of this entire essay, as if it was nothing but a baseless conspiracy theory. Most tellingly, Mitchell purposely does not provide a link to zombietime, so that his readers would be unable to judge for themselves whether or not the entire incident was indeed a "clumsy hoax." This enables him to lazily rely on one of the debunked putative rebuttals cited above ("The Israeli Admission") without mentioning to his readers any of the points which negate the rebuttal. Isn't Mitchell capable of generating his own challenge to the evidence, aside from rehashing a challenge that I myself had already raised solely for the purpose of debunking it? Apparently not. Flatly stating, as Mitchell does, that "there is no such proof" without anything to back up the statement only further confirms that he has no answer at all to the evidence presented here. In a speech to Australian newspaper publishers this week, he accused us all of willingly falling for a Hezbollah-contrived conspiracy, our eagerness to do so being dishonest and irresponsible and, according to Herald Sun columnist Andrew Bolt, fuelled by an anti-Israeli bias. "What concerns me greatly is the evidence of dishonesty in the reporting out of Lebanon," Downer said, adding later that "it is beyond serious dispute that this episode has all the makings of a hoax". The source of his findings was a right-wing Florida-based website, zombietime.com, which had devoted 28 pages to discredit the story and lambasted the world's media for covering it. Downer finds the blog to be a compelling condemnation of the foreign media's competence and ideological stance in Lebanon. 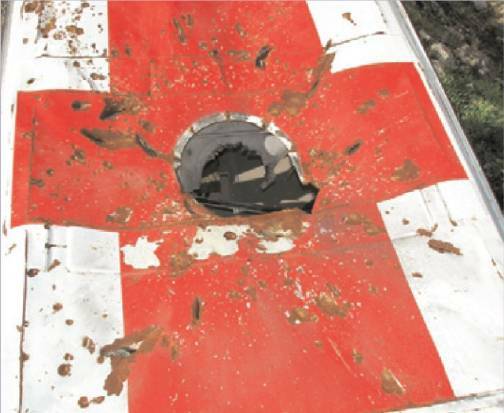 Key planks of zombietime.com's allegations are that a missile would not cause the type of damage done to Ambulance 782; rust around the damaged roof showed the damage was done some time prior; neither driver was seriously injured; Shalin's injuries seemed to heal miraculously; and the Israeli apology was merely a matter of course. I was in Tyre on the night of the attack and investigated the incident closely the next day. Chulov then goes on to state in no uncertain terms that the incident was most definitely not a hoax, and that Downer was a fool to believe an untrustworthy blog. Unfortunately for Chulov, in his zeal to doubly affirm the validity of the story, he digs his hole even deeper by producing an entirely new version of what happened, that simultaneously contradicts his earlier report yet also remains completely unverifiable. His only "evidence," yet again, is the testimony of the people who claim to have been attacked. And though he informs his readers that he went back to "inspect the damaged ambulances" he took no pictures to either validate his claims or to challenge the evidence here. * Shalin "remembers nothing" after the flash-bang-crunch of the crash AND he remembers that "then there was a battle for the next hour" and "we hid in a building convinced we were going to die". Chulov stands by his original story? Then why did he change all of his original details? Could Chulov be so clueless not to notice that the story had changed so completely, and precisely in a way to explain the doubts raised by the blogs? ... this hilarious attempt to argue that the people who told Chulov a pack of lies must now be believed because he checked with the liars a second time. Andrew Bolt, another Australian columnist, also takes Chulov to task simply by reiterating the wide variety of photographic evidence that Chulov chose to ignore, and then again by consulting with a munitions expert who explains in detail how the ambulance simply could not have ben struck by a missile, fired by a drone or anything else. I was in Tyre on the night of the attack and investigated the incident closely the next day.... We inspected both ambulances, whose mangled roofs were not rusting at the time. By the time the photos used on the blog site were taken, rust had appeared. But this is entirely normal in Lebanon's sultry summer climate, where humidity on the coast does not drop below 70per cent. Again, we are expected to take Chulov at his word. But a cursory investigation tells a different story. 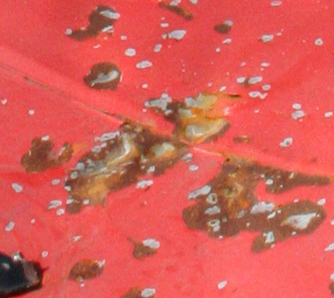 Rust generally only forms in the presence of moisture. But weather reports (and a great number of testimonials from residents of Northern Israel who emailed me) show that it did not rain in that region during the last week of July, and that the total precipitation in the area was zero. Furthermore, no atmospheric precipitation of any kind formed during that period as well, as revealed in weather reports for July 24 for the three nearest cities to Tyre with weather stations (and Tel Aviv and Beirut are both coastal, like Tyre, and have essentially identical weather). As long as the air temperature remains above the "dew point temperature" (the temperature below which precipitation forms and remains), then no dew, mist, fog or other moisture forms in the air. As the links above all show, at no point on July 24 or any time during the succeeding week in any similar nearby city did the air temperature fall below the dew point temperature, even at night, meaning that any exposed surfaces would have remained dry. And many commenters on various blogs have pointed out that "70% humidity" does not mean damp, or even muggy, and that 70% humidity is average and typical for climate all over the world. Chulov explains the rusting in part by "where (Lebanon's) humidity on the coast does not drop below 70per cent." If you ever want a fine example of a non-sequitur this is it. Humidity in Lebanon is currently at 75%. Over next 5 days projections are around 50%. Humidity at the Australian Antar[c]tic Division Weather station at Casey (66 Degrees South - perched on the edge of the Antartic Ice cap) is currently 82%. Phew, must be pretty tropical and humid down there eh? Far worse than the paltry 70% Chulov quotes. Here's an image of it. Note all the beach umbrellas and palm trees....A high relative humidity does not imply what people refer to as "high humidity" atmospheric conditions. And vice versa. But then again, not much in his story is correct, so I shouldn't expect him to bother too much about the atmospherics. "Dusty" emailed to say, "I quickly skimmed the weather data for Beirut, Damascus and Tel Aviv (those were the closest locations with available data and served to enclose the subject area.) I checked the dates for all three cities from July 24 to August 1. The results: Temps are in the range of high 80's to lows around 70 (F); hotter and drier in Damascus. Humidities range from 40's to 60's with dew point temps lower than low temps. No rain recorded in any city and no indication of even a trace. So you are right about the weather for the period of time discussed in your story." As with just about everything in his story, we only have Chulov's word to confirm any of his allegations. As soon as any evidence is consulted, it contradicts his claims. We also visited Ahmed Mohammed Fawaz, whose lower left leg had been amputated and whose severe burns ironically had saved his life by sealing blood vessels and arteries. And yet the ITV video taken just hours after the attack shows the now-famous man whose leg was sheared off by the missile -- and as the screenshot above reveals, it was his right leg that appeared to be cut in half, while his left leg seems to be all there. Were there two men in the ambulance, one of whom lost his left leg while the other lost his right? Are the Lebanese Red Cross workers having a bit of fun with the gullible Western reporters, switching them back and forth at random? Or did the tale-tellers simply not bother to keep track which leg was supposed to be missing, and led Chulov to the nearest one-legged man for an interview? Or can Chulov simply not discern left from right? Speaking of left and right: The Western Journalists in Support of Palestine site has an approving link to a Chulov article, while another blog pointed out that Chulov has been overly forgiving of Hamas at times. Michelle Malkin and the TacticalMiddleEast blog also have roundups of the various Chulov debunkings. Maurice Ostroff published an open letter to Martin Chulov pointing out many of the inconsistencies in Chulov's ambulance reports. Oh, and one last point: The thrust of Chulov's article basically boils down to the claim that, as a "journalist," he is inherently more accurate and trustworthy than a mere "blogger." And yet he demonstrates his factual accuracy by getting every single point about zombietime completely wrong. a. Zombietime is not based in Florida -- it is based in California, as a cursory inspection of the site would have revealed. b. I am not "right-wing," despite what zombietime's detractors may want to think. If exposing extremism and political bias makes me a "right-winger," then the term has lost all meaning. I support progressive liberal democracy; if anything, groups like Hezbollah should be considered "right-wing" according to the traditional meaning of the term. c. A trivial detail, but I did not devote "28 pages" to the report. When Chulov printed out the essay it may have taken 28 pieces of paper in his printer, but any single Web page online technically speaking counts as a single "page" in Internet terms -- a long page to be sure, but just one. Web pages are not measured by how many pieces of paper they occupy when printed out on this or that printer. d. Zombietime is not a blog. It is simply a Web site. Blogs have a specific format, created with blogging software and templates, that usually allow for quick and easily daily posts, with automated reader comment sections, timestamped postings, columns on the side for links and ads, and so on. Zombietime has none of these features; it is a simple Web site using basic html, and no blogging software. If Chulov can't even get the basics right about the topic of his article, what does that say about the rest of his facts? Australia's The Age sent its reporter Sarah Smiles to follow in Martin Chulov's footsteps by re-interviewing the same victims and drivers yet again. Her story was published in The Age -- along with a slightly abbreviated version in the The Sydney Morning Herald -- on September 2. However, Red Cross volunteers manning the ambulances and Mr Fawaz insist the hit was caused by small weapons fired from unmanned drones that they heard circling above after the attack. The Age visited the yard where the bombed out ambulances are now parked. This reporter saw the ambulance that Mr Fawaz was in. It appeared to have been hit by a weapon that punctured a huge hole through the back. The zombietime.com only shows the picture of the second ambulance that had a smaller puncture through the top where there was a pre-existing vent in the centre of the vehicle. 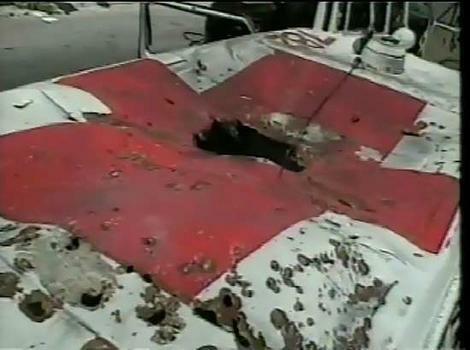 The holes in the ambulances, parked in the coastal town of Tyre on the Mediterranean, are now covered in rust. Based on photos of the ambulance's exterior that do not reveal any blood, the site suggests that Mr Fawaz incurred his injury elsewhere and was "paraded before the cameras as a victim of an Israeli missile". While the interior of the ambulance has been gutted, a Red Cross volunteer who was in the same ambulance as Mr Fawaz said he did bleed onto his stretcher, but not excessively as his leg had been cauterised. 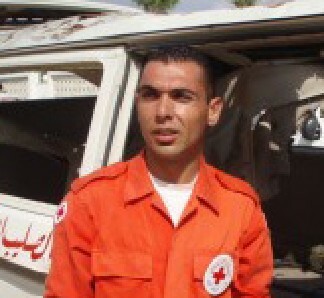 Mohammed Hassan, 35, a Red Cross Cross volunteer in the ambulance with Mr Fawaz when it was hit, said three volunteers fled to a nearby building after the attack. Mr Fawaz's elderly mother Jamila crawled out of the vehicle while the volunteers carried Mohammed, Ahmed's son, who was unconscious. They could not reach Mr Fawaz with rockets from drones hitting around the ambulance and the building they were in. "If (Alexander Downer) thinks it was a hoax, he should come and see the ambulances himself," said Sami Yazbek, the head of the Lebanese Red Cross in Tyre. "What, he thinks we lied?" said Mr Hassan in disbelief. He said he was saved by a helmet and bulletproof armour he was wearing that was strafed at the back. He said his helmet is pocked where shrapnel hit. Lebanese Red Cross volunteers are certain the weapons were fired from a drone. Mr Fawaz, who slipped in and out of consciousness after the blast, remembers hearing the sound of a drone whirring above him when he came to. "It sounds like a motorcycle." Soon after, through the door of the ambulance that had been blasted open, he recalls seeing a second strike on the ground. "It was a drone because if it was a warplane we wouldn't be alive," he said. When he came to after the blast, he remembers reaching for his glasses that were knocked to the back of his head, adjusting them and then feeling a sense of malaise. "I put my hand on my leg and I couldn't feel it," he said. "I tried to take the cord of the IV drip to tie up my leg to stop it bleeding, but I couldn't manage it." Every section highlighted in bold above contradicts the original accounts of the incident. Originally the attack came from a jet, then from a helicopter, then a month later from a single drone, and now, according to Smiles' version, from multiple drones. What was originally one missile became two missiles and now Smiles tells us that there were uncountably many "rockets from drones hitting around the ambulance." These super-drones not only could launch missiles and rockets, but also have "small weapons" that fire bullets that "strafed" the ambulance and its driver, who was only saved by bulletproof armor that he somehow never managed to mention the first hundred times he recounted his story. It's fairly obvious that the ambulance drivers are just improvising as they go along, inventing new embellishments in each interview, and responding to doubts not by toning down the exaggerations but rather by amplifying the scenario wildly until it no longer even vaguely resembles the story they originally told. And Smiles, obligingly, scribbles it all down for our benefit, unintentionally proving the main point of this essay -- that the story as originally recounted in the media is false. Now The Age tries to defend the missile-through-the-red-cross ambulance hoax. 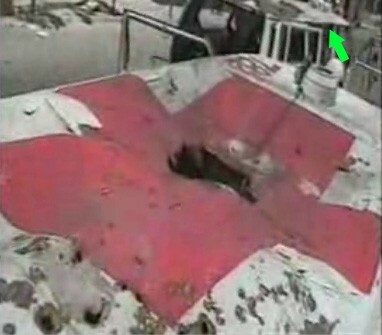 * The missile through the Red Cross painted on the roof of one ambulance becomes a possible missile through the back of the other of the two that were attacked. 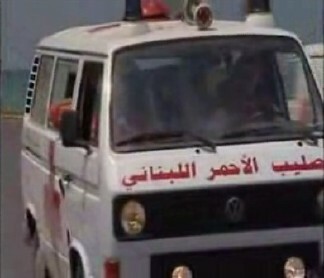 * The first ambulance that was hit by a missile is now hit instead by "small weapons". * A man who had his leg blasted off in the ambulance with the hole through the Red Cross now has it blasted off in the ambulance with the bigger hole in the back. * A medic explains the strange absence of blood in that ambulance by saying the injured man's leg was "cauterised". * An attack launched by Apache helicopters is now launched by drones. * A driver who was first reported to have been knocked unconscious in the attack this time fails to mention that, claiming only that shrapnel-pocked helmet saved him. * Curiously, all three Red Cross workers who were there and were interviewed after the alleged incident, claim they were saved by a shrapnel-pocked helmet. None were actually wounded with all this shrapnel flying about. No explicit acknowledgement is made of what seems even from this story to be conceded: that The Age's initial claim that a missile was fired through the Red Cross symbol of ambulance was false. Nor does it admit what it also seems to concede: That the ambulance first pictured as "proof" of that missile strike was not hit by a missile at all. Why we are only now shown a picture of the alleged ambulance that Smiles says was damaged worst -- and presumably this time by a missile? Why did the media ignore this more dramatic picture that would have better proved their claims of an Israeli atrocity? Why is an ambulance hit by a missile still largely intact? Don't Israeli missiles work? 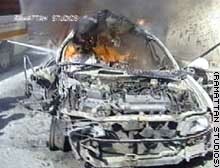 Why did a missile attack on ambulances not only fail to destroy them, but fail to kill any of the people inside? Why did The Age initially report both ambulances were in fact hit by missiles, when it now seems to concede that -- at best (or really worst) just one was? Why has an attack that one medic first said occurred as he was driving now changed to an attack as he was transferring patients? Why was an ambulance hit by something that caused a huge "explosion" and "fire" show no scorch marks at all, and have a window caved inwards, not outwards? Why did an ambulance allegedly attacked by Israel have the torn metal covered in rust in an initial Age picture take just one or two days later? Why did a medic shown in hospital covered in bandages appear in pictures just days later with not a scar or scratch on his skin? All strange questons needing answers which Smiles fails to provide. The father's leg was severed by the exploding missile and he was losing blood fast. An elderly woman patient was relatively unscathed, but Mohammed Mustafa Fawaz, 46, was in the intensive care unit, the stump where his right leg used to be swollen and bleeding. So, who is lying, Smiles or Blanford, Fawaz or the unnamed Red Cross volunteer? This is basically an attempt to dredge up "Claim #6" from above -- that we're all analyzing the wrong ambulance. But as has already been pointed out -- Ambulance #782 was specifically identified as "the" ambulance where the main strike took place; which had its roof pierced by a missile; in which the passenger had his leg amputated, and so on. 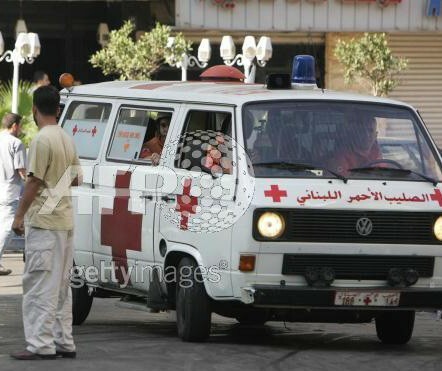 It was Ambulance #782 that was photographed repeatedly, which was displayed in front of the Red Cross office in Tyre afterwards, which the driver posed in front of and pointed to as evidence, and so on. And after all that, we are told by Smiles and her handlers: Wait! That's not the right ambulance! There's a different ambulance that you've never seen before, and that's the one that was hit on the roof by an Israeli missile which sheared off a man's leg. Here it is, over a month after the fact, rusting away in a junkyard! Sorry -- we forgot to mention it earlier. And no one ever bothered to take a picture of it before. Forget about that silly old Ambulance #782! The picture pretty much debunks itself. Riehl World View was convinced that the Age photo might very well show the actual second ambulance, but Power Line isn't buying Smiles' account or Riehl's doubts. 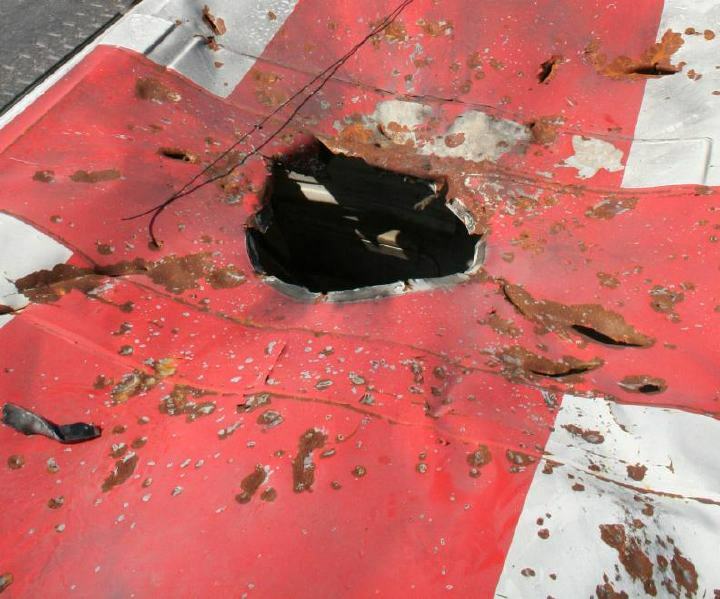 Also, notice, as an aside, that the Age photo shows a vent cover in place on top of the vehicle's Red Cross, proving once and for all that the "missile hole" in Ambulance #782 was actually a pre-existing part of the vehicle's design. Did Smiles naively swallow a tall tale without even slightly investigating the claims? Or is she sympathetic to Hezbollah? We may never know. As a companion piece to the Sarah Smiles article, The Age published a juvenile ad hominem attack on me personally. This was an essential component of their attempt to resuscitate their ambulance story: first reiterate their claim of infallibility, and then attack the credibility of the "person" they perceive is challenging them. None of this behavior in any way debunks the evidence given here, but it is a commonplace technique for dishonest debaters on the losing side of an argument. WHO is the Zombie behind zombietime.com? He claims to be a "photoblogger" who lives in San Francisco. For fun, he attends protests by people of opposite political inclinations to his own -- the extreme left. He turns their placards against them, takes photographs and posts the images on his site. In this vein, his happy snaps of the 2006 World Naked Bike Ride are well worth a look. But recently he has turned investigator, challenging photo agencies such as Reuters over the alleged manipulation of images and -- infamously -- arguing that the bombing of an ambulance in Lebanon was a hoax. Last month, another right-wing blogger ("Blonde Sagacity, the conservative that liberals hate to love"), claimed a rare interview with the Zombie, in which he chatted about his anonymity, his tricks to obtain pictures (sometimes the camera is hidden, sometimes he plays tourist), and his motivations. "The anti-war movement is really an anti-American movement," he told Blonde. "The media (try) to demoralise the country by portraying the anti-war movement as reasonable, widespread, and destined for victory. But in fact it is a hate-fuelled fringe movement that only maintains even a hint of credibility due to media misrepresentation. That's something I'm trying to correct." Just how successful the Zombie has been in spreading the message is not clear. The site technorati.com -- which measures the connections and mentions that build credibility in the web -- show it as a low-wattage player. Yesterday it had 955 blog posts, while Melbourne conservative Andrew Bolt had 4260, and the influential US Drudge Report more than 41,000. Though none of this is relevant to the issue of the ambulance, I will address some of the points in the article, since The Age seems to think that my identity and personality -- as opposed to the evidence I have pointed out -- has some bearing on the incident. * I am not "right-wing." Far from it. As mentioned above, I believe in progressive liberal democracy. If one still accepts the cogency of the now-outdated and politically irrelevant left/right dichotomy (which I don't), then if anything it is the people who consider me their foe who ought to be considered "right-wing," by its traditional definition. I am pro-freedom, and have a distaste for totalitarianism and theocracy. "Left" or "right" have nothing to do with it. * I try not to "taunt" anybody. I just try to present or analyze photographic evidence. Nor do I consider anyone my "foe." If people out there don't like the evidence I present, then it is they who feel taunted and who define me as their foe. * "He"? Where did they get that? I have never stated my gender. Jumping to conclusions. * I have never claimed to be a "photoblogger." In fact, I've never used that term at all. Others may have used it to describe me, but that's as far as it goes. * I have never said where I live, either. Yes, I take photographs in San Francisco frequently, but that does not mean I necessarily live there. Again, jumping to conclusions. * I take my pictures "for fun"? Quite the contrary -- it is hard work, and decidedly unpleasant. I do it because it is necessary, not because it is fun. Of course, saying that I do what I do "for fun" is nothing more than a heavy-handed attempt to brand me as an untrained amateur whose opinions are therefore marginalized. In fact, the entire article is nothing more than that: a petty ad hominem attack to undermine my credibility, as if that somehow would prop up their arguments. This is a logical fallacy used by debaters who have run out of valid arguments. * "Infamously." Classic. This counts as journalism? * If I'm such a low-wattage player, then why am I being profiled in The Age? Anyway, I've never claimed to be "high-wattage," nor does my wattage have any bearing on the evidence presented here. * Chandler completely misapprehends the Technorati statistics. The number "955 blog posts" she refers to is not the number of posts I have made, but rather the number of blogs that currently have a posting that mentions the word "zombietime." Comparing my mentions to those of a columnist in a mainstream high-circulation newspaper (Andrew Bolt), and to the most popular independent news site on the entire Internet (Drudge) is a conscious attempt to make my influence seem puny. Since few people actually use the word "zombietime" in their postings, preferring instead to just call me "zombie" or to link to my reports without mentioning me at all, a more accurate Technorati search can be made by searching for any blog posts that link to my site, which gives (at the time of this writing) 6,349 links -- while Andrew Bolt gets 379 links (many of which are about my report anyway) while Drudge has 24,000. If being one-fourth as bright as the most powerful light on the Internet (Drudge) makes me low-wattage, then low-wattage I shall be. Tim Blair jumps to my defense with a humorous rebuttal of Chandler's hit piece (and of Smiles' article as well). On Tuesday July 25 the Guardian carried a report from south Lebanon headed: Red Cross ambulances destroyed in Israeli air strike on rescue mission. ... The report was filed from the southern Lebanon city of Tyre by one of the paper's most experienced foreign correspondents, a former Jerusalem correspondent, Suzanne Goldenberg. Her report was compiled from information provided on the morning after the incident by the Red Cross in Tyre and from interviews with ambulance workers and others in hospital who said they had been injured in the attack. The ambulances were seen by the Guardian's staff photographer, Sean Smith, on July 25 (the day the Guardian report of the incident was actually published). He was able to see them before they were removed from the site where the attack was said to have taken place. Smith, who now has considerable experience in war zones, remains in no doubt that the ambulances had been subjected to a recent attack consistent with what had been reported. What the zombietime website, which takes issue with both of these Australian rebuttals, does show is a fairly large number of inconsistencies and anomalies in the reporting and pictorial coverage of the event across the media: whether these are larger in number than might normally be expected to occur in reporting from a war zone is a matter for conjecture. A Guardian picture archivist with a special interest in images from areas of conflict, who carried out extensive research for me, concluded that there was cause for doubt about the nature of the munitions involved and the manner of their delivery, but not in the reality of the attack. Suzanne Goldenberg told me: "I remain confident that the story was true." She points out that she and Sean Smith reported the story first hand and independently and did not rely on what purported to be amateur video footage of the incident. An Israeli military spokesman in a statement to the Guardian said, "This was in a very dangerous area ... from which 150 rockets had been fired before that date. We had advised the civilian populations and other organisations like the UN and the Red Cross that it was a dangerous area and any movement had to be coordinated with the Israeli army. We don't know for sure if those two ambulances were hit by Israeli fire. We cannot confirm or not confirm. "All we know is that we don't know of any incident when Israeli missiles would have hit a vehicle marked as being a vehicle from the Red Cross. We don't recognise hitting any Red Cross vehicles on that date in particular." ...He [Roland Benjamin-Huguenin, the UK spokesperson for the International Committee of the Red Cross] had seen the ambulances and saw no reason to question that they had been subjected to an attack. He told me that the Red Cross "categorically rejects and denies" the version being circulated on the internet. The zombietime version invites the conclusion that the Lebanese Red Cross conspired in an elaborate anti-Israel propaganda plot to dupe the world's media. I do not think that is proven at all. What's not proven is the Guardian's account of the incident. And yet they refuse to backtrack even one step, and they stand by the veracity of their original story. What Mayes and the Guardian fail to grasp is that a new journalistic paradigm has arisen in which reporters making controversial claims must back up their stories with proof. The whole point of this essay (and of zombietime overall) is that media consumers now demand to see the evidence themselves. No longer will they passively accept the assurances and authority of the media. If a reporter is to report something important, especially in a publication known for a certain political bias, then it now behooves that reporter to prove -- or give solid evidence -- that it is true. Just because you say something happened, and then reassure us that it really did happen, doesn't mean we automatically believe you any more. Where is the evidence? There once was a time when the media had earned our trust, so that people were confident that the media always told the truth. That era is now over; the media has squandered its credibility. And the more they rely on a good reputation that no longer exists, the more their crediblity is eroded. And speaking of credibility: did Suzanne Goldenberg have any to begin with? She is widely noted (during her tenure in Jerusalem for the Guardian) for having a strong anti-Israel bias, as revealed in this eye-opening article by Tom Gross in the National Review in which Goldenberg and her boss, Guardian editor Alan Rusbridger, are both shown to slant stories to reflect badly on Israel. In fact, Suzanne Goldenberg is regarded as a favorite writer by virulent anti-Israel groups like "From Occupied Palestine" which regard all of Israel as "occupied land" and want to see an end to Israel as a nation. Goldenberg's 2000 article alleging anti-Arab beach apartheid in Israel was also roundly condemned as being of dubious veracity. "The Blank Pages of The Age" blog takes Mayes to task for standing by the story with no evidence to support his stance, summing up with "...The Guardian is prepared to rely on the veracity of reports based upon statements made by at least one eyewitness who is a proven liar. ... All this proves is that, like the Australian and the Melbourne Age, the Guardian is more concerned with protecti[ng] the reputation of its reporters than it is with uncovering the truth." Tim Blair juliennes Mayes's arguments, pointing out that Goldenberg's original story was quite definite about the attack allegations, which contravenes Mayes' subsequent line that the "fog of war" makes for understandable incertitude in war-zone reportage. Israellycool blog dissects line by line the fallacies of the Guardian's "Appeal to Authority" argument, concluding, "So to summarize, The Guardian has rejected Zombie's expose on the basis of a Guardian picture archivist, a pro-palestinian reporter who is clearly lying, and a Red Cross official. I rest my case." Melanie Phillips ponders Mayes' column and states, "[According to Mayes,] Zombietime's claims are 'not proven' -- so end of story. The Lebanese Red Cross claims were not only 'not proven' but, for anyone using eyes and a brain, were inherently implausible -- and yet the Guardian (and many other media outlets) reported them as fact." Bagel Blogger revisits the entire scandal and concludes that the Mayes article is a "white wash."
The New York Times has never published either a retraction or a defense of its claims about the ambulance incident, but Senior Editor Greg Brock has sent open letters to any readers who have questioned the Times' coverage, and has also responded directly to inquiries from zombietime. A reporter for The New York Times was on the scene in Lebanon and was in a convoy that passed the ambulances just days after the air strike was reported to have taken place. Our reporter interviewed the ambulance crews and also interviewed another Red Cross official who was on the scene. His report was included briefly in the main article about the war that appeared in the Times on July 24. The story did not say the ambulances were targeted by Israel (nor did The Times report that one of the passenger's legs was sheared off, as some observers have said we did). "Overnight, two Red Cross ambulances were bombed within moments of each other while taking wounded people to Tyre, the Red Cross said. One man who was being transferred died of his wounds, while others were severely injured, and six paramedics were hurt in the attack, in the town of Qana." That is all we printed on that day. The reporter tells us that he had considerable reason to believe that the episode had taken place because the condition of the ambulances was not unlike other vehicles he had seen in the war area. 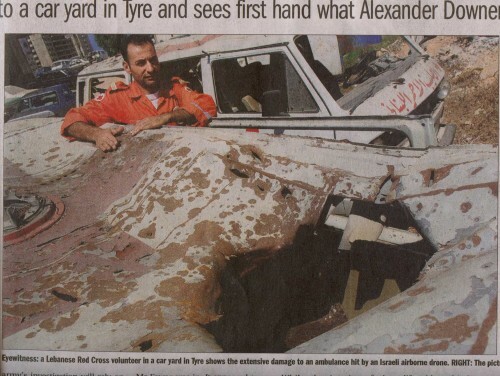 Given the rusty condition of many of the Red Cross vehicles in the Tyre fleet in the first place and the humidity in the area (it is close to the sea and is not a dry climate), he does not believe that the reports of rust further developing over the course of a week or two would be unusual. He also noted that there had been reports for days from both the United Nations peacekeepers and the Red Cross about bombs and shelling in the vicinity of their vehicles. "Missiles hit two Red Cross ambulances last weekend, wounding six people and punching a circle in the center of the cross on one's roof. 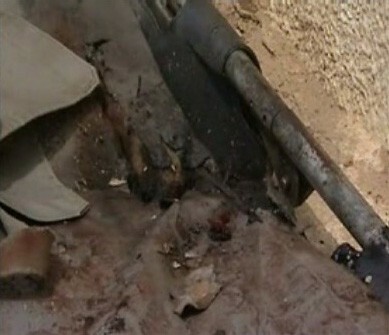 A rocket hit the ambulance convoy that responded in Qana on Sunday." The reporter who wrote this paragraph consulted her notes and says that the information came from a Red Cross worker in Tyre. We have checked with the Red Cross again, and they continue to conclude that two of their ambulances were hit on that night. We are continuing to do reporting on the ground, and if we find there is reason to believe that what we reported was not accurate, we will publish either a correction or an article, whichever is appropriate. The following statement was issued on Monday, Sept. 4, after we again went back to the Red Cross to do more reporting. Please note that this is the Red Cross speaking, not The Times. And the reference that Israel was asked to take measures to avoid such an incident is part of the statement by the Red Cross, explaining what action it has taken. I hope this helps in understanding the confusion over this incident. As noted in earlier e-mails, The Times never reported that the strike was by Israel because we do not know that. All we can do is to explore all avenues of reporting. "We can confirm that on 23 July at 11:15 p.m. two ambulances were struck by munitions although they were clearly lit and marked. "The incident happened as the ambulance workers were transferring patients. We have reported the incident to the Israelis and requested that they take all necessary measures to avoid such incidents in the future." Let's look at some of Brock's statements. First, as the Red Cross confirms, the "attack" happened at 11:15 p.m. on July 23. The Times' first report about the incident came out the following day, no more than 12 hours later, on July 24. And yet Brock tells us that a reporter drove by the scene "just days" after the attack, and then interviewed the Red Cross workers, and then somehow traveled back in time to file his report on the morning of July 24. Either Brock or the reporter are lying about or misremembering the sequence of events, because the reporter must have been on the scene just hours after the attack -- not "days" -- if his report was filed and published on July 24. The rationale behind this chronology-fudging becomes clear in a later paragraph, when the "days" get added on to "a week or two" to allow enough time for the rust visible in the photographs to develop. It seems as if Brock and the reporters are trying to pad the elapsed time to explain away the rust. But whatever rust the reporter saw, he must have seen it just a few hours after the supposed incident -- half a day or less -- since the Times published his report no more than 12 hours after the incident. The reporter also attempts to explain away the rust by saying that even the undamaged Red Cross ambulances in Tyre are rusty in general, due to the climate of Lebanon. But even a cursory glance at photos of the Tyre ambulance fleet shows this to be untrue. Look, for example, at the three pictures of undamaged ambulances in "Claim #1" near the top of this essay, and then at the many ambulances in the background of the high-resolution picture in "Claim #2." They all appear to be in pristine condition, without a spot of rust on them. The reporter also claims that the attack seemed credible because there had been other reports of shelling "in the vicinity" of ambulances. But there's a big difference between there being shelling near an ambulance which is rushing into a war zone to pick up casualties at a site where fighting must have just occurred (when shelling near ambulances would be expected), and an apparent deliberate attack directly on the center of an ambulance. Again, we see a case of "creeping insinuations" in which unverified claims of shelling "in the vicinity" of ambulances opens the door of believability to attacks directly on ambulances which leads to the assumption that those attacks must have come from Israel. And although the Times (unique among almost all the media) never did explicitly state that Israel was responsible for this incident, the blame was implied and almost everyone who read the Times' version jumped to that conclusion; and all of the media outlets that followed the Times' lead on this story definitively blamed Israel. Most revealingly, the reporter who wrote the inflammatory claim that the hole in the center of the cross on the roof was caused by a missile strike had to "consult her notes" to remember that the story came from "a Red Cross worker in Tyre" (obviously Mr. Chaalan), and had no substantiation to back it up. This crucial point, glossed over by Greg Brock, shows beyond any doubt that the entire story came from the lips of either a single Red Cross worker or a small group of them, and that none of the Western journalists -- including the reporters for the New York Times -- made any attempt to verify or confirm the story. They eagerly bought into the tale with total credulity, and reported it as fact. And what's their defense for this? None. Brock promises that the Times would publish a correction if there was "reason to believe" the story was false; yet despite all the evidence presented here, the Times has not retracted a single word of their report. I don't really know what to say other than we published what we learned from our reporting. We went back to our reporters, who gladly reviewed their coverage and stood by it. As we have said, one reporter did see the ambulances and interviewed Red Cross officials on the scene. In addition, we continued to press the Red Cross for as much information as they had. The bottom line is that we believe our reporters: the incident did happen. And we feel that the Red Cross is a reputable, independent source -- one that we have quoted for years on many issues. So we had no hesitation in quoting Red Cross officials in our initial story. Having reported that, we felt comfortable with the information in our second story -- the sentence you cite below. The second story certainly could have included "Red Cross officials said." But we had confidence in our reporters and had no problem with the second statement [that the hole in the cross was caused by a missile]. I suspect you will not agree with my explanation, but it is the only one I can give because all I can address is what The Times reported and printed. If others have information that they say shows the incident did not happen, then they can report that. Our reporting does not show that. For that reason, there is no need for a correction. So, the New York Times' "defense" of their coverage boils down to nothing more than this: Our reporters are trustworthy, and therefore you should believe what they say. And the Red Cross is trustworthy, therefore you should also believe what they say. Period. Flat-out, unrepentant "appeal to authority," as if that fallacy somehow supported their position. And the evidence showing that the "attack" did not happen as reported? The evidence apparently is of no concern to The New York Times. On January 1, the radio program "Culture Shock," produced and broadcast worldwide by BBC World Service, featured a special program about the most important social trends that will shape the year 2007. One of these trends was identified as "zombietiming," in which bloggers will redefine journalism by relentlessly fact-checking the media. The broadcast specifically referred to this essay as the prototype after which the new phenomenon is named. You can listen to the entire half-hour broadcast live on the BCC site by clicking here. (The streaming program will probably only be available until January 7, 2007.) The section about "zombietiming" starts about 20 minutes into the program. "Zombietiming" on BBC's "Culture Shock" program (2.4mb mp3 file). You're listening to the BBC World Service, and this is Culture Shock. Lawrence Pollard (host): Hello, I'm Lawrence Pollard, and welcome to a very special edition of Culture Shock: four leading experts in the fields of technology, business, marketing and trend-prediction are here today to tell us what 2007 has in store for us. Our four prophets will give us a glimpse of the future, and they'll tell us each what they predict will be the defining trend of the next twelve months. And without further delay, let me introduce our council of experts. ... Tim Jackson is also here in London. Tim is a business entrepreneur and writer, recently selected as one of the 100 Global Leaders of Tomorrow at the World Economic Forum in Davos, no less. In addition, Business People in the New Economy recently voted him one of the most important people they would like to have in their contact book. He's in house, he's here. Tim, Thanks for coming. Again, briefly, what do you think will be shaping 2007? Tim Jackson: I think the biggest trend is going to be something which I call "zombietiming." And it's exceptionally bad news for journalists, because it's a trend in which people out there on the Web will be checking facts of television, radio and newspapers, and hauling people to account when they get them wrong. Lawrence Pollard: So, we could all be out of a job. Thank you, Tim. We'll hear more from that in a minute. And so finally, we come to Tim Jackson for our last big trend of 2007. Now, Anna's just been telling us how 2007 will become less cynical, but Tim: you're predicting we're going to grow more skeptical. You've got the best name for a trend: "zombietiming." And now this goes back, I gather, to the enormous amount of argument in blogging sites and on the Internet over the reporting of a rocket attack during the Lebanon War. Basically, um, whether or not a Red Cross ambulance had been hit by an Israeli rocket, and if it had been reported properly by the news agencies and so.... This is a story that just mushroomed and went on and your point is that this is going to go on and grow and it's going to become one of the big things of 2007. Mary Meehan: ... There is just this lack of trust out there. That lack of trust drives bloggers' needs to prove the media wrong and bust the myths and expose the lies -- y'know, be it lies or not -- and they have the power and the platform now to do it. They just don't trust something they can't see through. It's that transparency that they demand and expect. And they're gonna expose it if they can't get at it. Fox News aired a short segment on the Brit Hume Show about the ambulance hoax and zombietime. The Israeli news service Arutz Sheva covered the ambulance story, relying extensively on this report. How long has this been going on? According to this article, Hezbollah experts helped Bosnian Muslims stage atrocities in the '90s for the purpose of stirring public opinion against the Serbs. On August 23, protesters occupied the roof of EDO, an arms manufacturer in England: "Andrew Beckett, press spokesman for the [protesters'] campaign said 'EDO produces components for the Hellfire missile, it was a Hellfire that was used to destroy the ambulance leaving Qana, on 23rd July this year. The directors of EDO are complicit in murder.'" The story was subsequently picked up by the Iranian goverment news agency, which repeated the claim that a Hellfire was used on July 23, even though Hellfires are hugely powerful and designed to destroy tanks; if one had struck the ambulance, it would have been completely destroyed. Bizarrely, there is now a new video game called "Zombie vs. Ambulance," but it's made in Japan and apparently has nothing to do with this essay. Recently, a rock band in Oregon also named itself Zombie vs. Ambulance. Scott sends in his design for an "Unverified Internet Blog" logo, instructing Web surfers (sarcastically) to "Ignore This Evidence." So, what really happened? The Lebanese and the global media insist that the ambulances were deliberately targeted by Israel, for the specific purpose of killing civilians and rescue workers -- a serious war crime. Israel, for its part, has stated repeatedly that it never intentionally attacks rescue vehicles, but otherwise has stayed mostly silent about the incident, apparently awaiting further information. But what would the average reasonable person conclude after reading and viewing all the evidence on this page? What do you think is the truth behind this incident? This story, as presented in the media, seems to have more holes than the ambulance roof. Not a single aspect of it holds up under examination. But then what did occur? Two ambulances that had been somehow damaged long before the July Israel-Hezbollah conflict even began were dragged out of a salvage yard, where they had been rusting for months or years. They were taken to a parking lot and smashed up even more, inside and out. Then fresh gurneys were placed inside one of them. An intentionally amateurish video was then taken of the two vehicles, in order to show the damage. That night, as planned, some Red Cross workers feigning minor injuries rushed into a hospital in Tyre, and recounted a tale of horror: their ambulances had been attacked by Israeli missiles. The media was notified. The next day, reporters from around the world interviewed the ambulance drivers as they lay in the hospital sporting prop bandages. The one driver who spoke the best English was quoted the most in the English-speaking press. The journalists, however, were not allowed to inspect the ambulances themselves; instead, the pre-packaged video was supplied to them, freezeframes from which were used as illustrations to accompany the articles. Three patients in the same hospital were identified as also being victims of the attack, even though their injuries had actually happened elsewhere. Every single Western reporter accepted the ambulance drivers' story without question. Emboldened by the media's credulity, the drivers exaggerated the severity of the incident with each new interview, until it no longer even vaguely matched the staged evidence. The story was broadcast to the world, and accepted as fact. A few days later, after the Western press had wandered away to find other stories, the damaged ambulances were towed and parked in front of the Red Cross office in Tyre, as a martyrdom exhibit for the sympathetic local press and residents. Few if any mainstream journalists ever attempted to verify any of the claims made by the ambulance crews, despite the seriousness of the charge. Could it be that the entire incident is a fabrication? All signs point to "Yes." If so, the implications are enormous, both for the outcome of the war and for the credibility of the media. Most analysts agree that Israel was pressured into a ceasefire due to international outcry over how it was conducting the battle. The media informed the public that Israel was intentionally targeting civilians; the public insisted that their governments demand that Israel stand down; international pressure was applied, and Israel caved in. And of all the incidents decried in the media -- taking out infrastructure, destroying Hezbollah-associated buildings that had not been fully evacuated, and so on -- only the ambulance incident could be held up as having no possible military purpose; all the other attacks were pointed out by Israel as being intended to degrade Hezbollah's ability to fight. Aside from a handful of stray missiles and accidents or misunderstandings for which Israel apologized, only this incident was "proof" that Israel was purposely aiming at noncombatants. So reports that an Israeli missile attack destroyed two ambulances played a role in shaping global opinion, which led to a ceasefire leaving Hezbollah intact. But if the entire incident turns out to have been an elaborate but clumsy hoax, where does that leave the reputation of the media? Not a single reporter or editor doubted the story for a second. Or if they did, they certainly didn't inform readers of their doubts. Why did the media swallow the story hook, line and sinker? In their zeal to bash Israel, did they allow themselves, consciously or unconsciously, to be duped by Hezbollah supporters into broadcasting propaganda as news? Or is the media so eager to jump on any fresh scandal that they simply switch off their critical thinking and become absolutely credulous of any juicy tale thrown their way? It took the blogs and non-professional independent researchers to shine the harsh light of forensic analysis on this case, in the process debunking just about every aspect of the allegations. And this was done merely with the meager scraps of evidence left over by the "professional" journalists, and by squeezing the maximum amount of information out of the subtlest of clues. But if the journalists who were right there on the scene had even the slightest interest in actually investigating the story, they had access to all sorts of information that could have blown the lid off the case. How hard would it have been to go back to the Red Cross office after a few days to inspect the ambulance carefully in person? 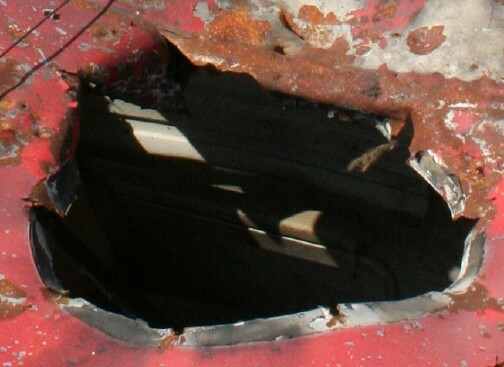 To look at the hole in the roof, to photograph the rust up close, to search for burn marks or blood on the gurneys, to notice the driver's healthy chin? Wouldn't that have been a scandal worth reporting? Is the media that gullible -- or does it have a political bias? Either way, its credibility has now been lost. Click here to view emails sent in by readers with a great deal of additional information, interesting theories and forthright opinions about the ambulance incident and this essay. If you have more evidence about the ambulance incident discussed on this page, above and beyond what is presented here, or if you have comments or corrections, send an email to zombietime here.